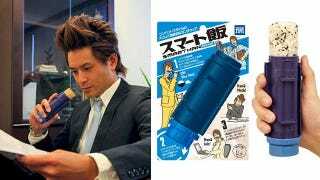 Taking some inspiration from the sucker-in-a-sleeve known as a Push Pop, Takara Tomy's Smart Han bento lunchbox lets busy office drones enjoy sticky rice lunch extruded from a large tube. It's not unlike the Sushi Bazooka, except that this contraption is designed to pump the food directly into your mouth. A screw on cap keeps your lunch fresh and moist until you're ready to dine, and a small container attached to the bottom holds dressing and other seasonings. You don't have to cram all that rice into a small opening, though. This is no muzzle-loader. The $26 Smart Han splits open lengthwise, so it's easy to fill with whatever you can imagine eating from a tube—mashed potatoes, lumpy oatmeal, whatever. The only limit is your imagination and gag reflex.